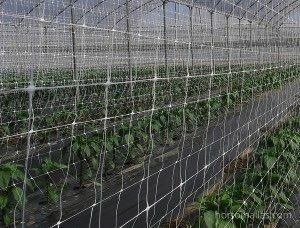 HORTOMALLAS: trellis netting for greenhouses and other protected environments. A greenhouse is like a Formula 1 car and trellis netting for greenhouses are their tyres. The success of a crop must also be attributed to a good support system for tutoring the crops. 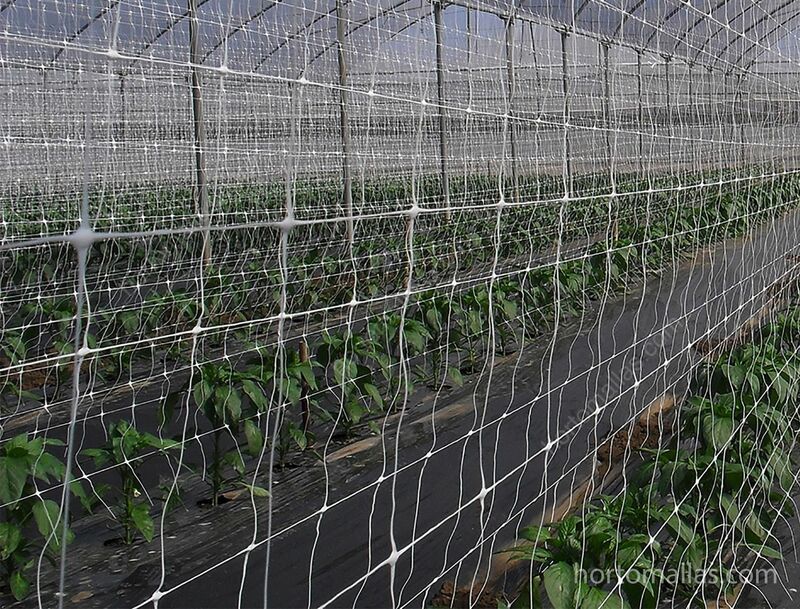 In contrast to raffia systems which require a large amount of manpower to daily guide each plant, using a double-walled HORTOMALLAS trellis netting eliminates most of the work as it allows the stems to grow through its squares and once securely fastened with HORTOMALLAS they can carry the fruits until they are ready to be harvested, avoiding almost all risk of viral, bacterial and microbial contamination by manual means (the hands of the workers as transmission vectors). 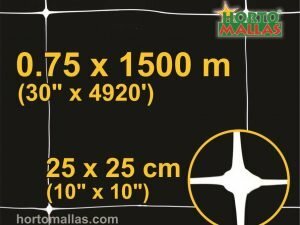 HORTOMALLAS trellis netting is available in large measurements for use inside greenhouses. 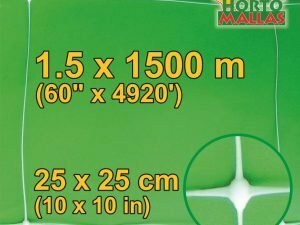 When used inside greenhouses or shade houses or anti-insect/aphid houses (also inside macro tunnels), HORTOMALLAS has lasted up to 5 or 6 years, allowing the cost to be off set against multiple crop cycles. It is long-lasting due to the fact that the polypropylene is not so affected by the solar rays as it is when used in open fields. 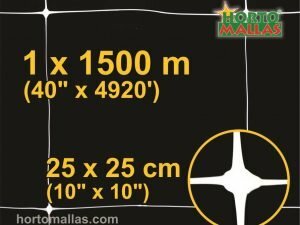 HORTOMALLAS can be fastened onto the cables or straps of the actual greenhouse structure, for unspecified varieties it is recommended that the plants be guided at an inclination of 30 degrees with clips or weaving the plant in between the squares of the HORTOMALLAS netting. 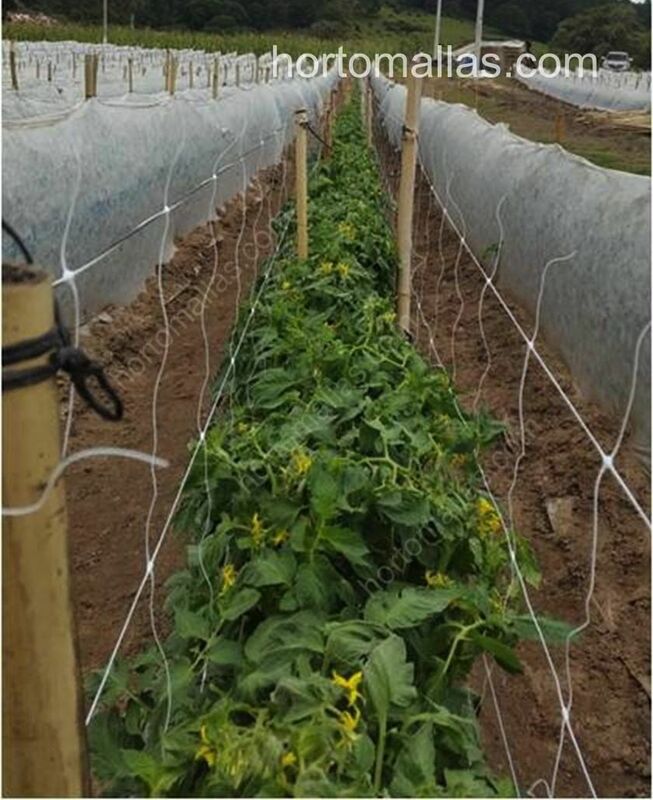 HORTOMALLAS trellis netting for greenhouses is also used frequently in micro tunnels such as INVERNAVELO, which is the sensible way to induce crops which have been recently transplanted from the furrows out into open fields. Using HORTOMALLAS as trellis netting you can tutor whichever crops need vertical support. 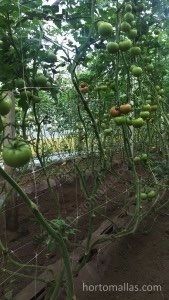 Advantages of HORTOMALLAS trellis netting in hydroponic greenhouses. Tutoring inside an agricultural hydroponic greenhouse is the same method of tutoring inside other greenhouses which cultivate the ground, but for reasons of plant health control, HORTOMALLAS is the preferred way of tutoring as it allows for asepsis of microorganisms compared to the tutoring that raffia offers. When cultivating unspecified plants they should be tutored at an angle of 30 degrees. It is important to check with the seed producer what maximum altitude the crop should be tutored up to, because there could be nutritional problems if they are too elevated (we recommend a maximum altitude of between 2.5 and 3 meters). The most commonly cultivated crops in hydroponic substrata are tomatoes, peppers and cucumbers. Tutoring tomatoes inside greenhouses using HORTOMALLAS is the best way of reducing the manual transmission of pathogens. 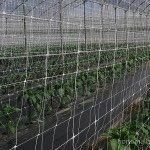 In these three crops, widely cultivated around the world and of high commercial value (tomatoes, cucumbers and peppers), the use of HORTOMALLAS trellis netting increases the yield by at least 30% as it reduces the mechanical stress and the rate of manual transmission of plant pathogens. 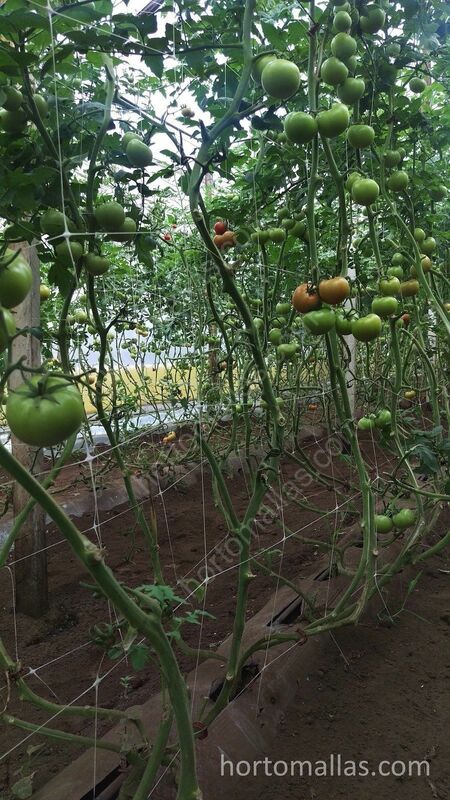 For solanceae it is especially recommended to use a double walled trellis system inside greenhouses as mentioned above, because these varieties need an extra support for their loaded down branching stems. As opposed to what happens with raffia tutoring, using HORTOMALLAS helps to prevent the upper stems from being choked as seen in the following image. 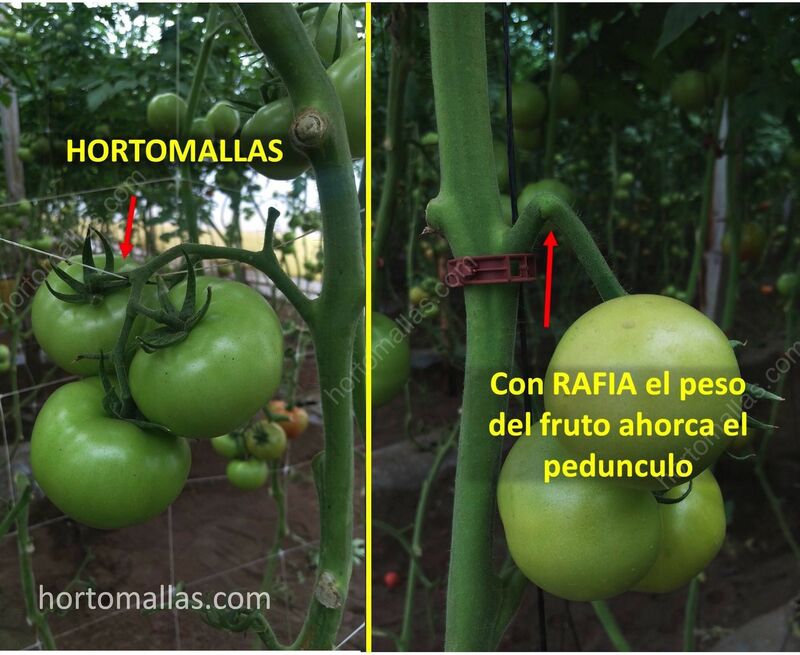 Comparison of the tomato fruit clusters when using HORTOMALLAS or when using raffia.